The doum palm is native to the Nile region in Africa. The edible fruits taste like gingerbread. Also called gingerbread palm, gingerbread tree, dhoum palm and Egyptian palm. 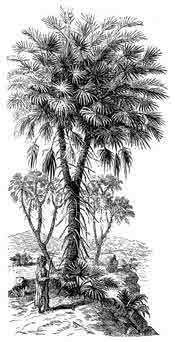 "The doum palm produces a refreshing fruit, in which I was able to detect the taste of gingerbread. A lady in Cairo ... once offered me a cool sorbet of doum fruit." Alexandre Dumas in his 'Grande Dictionnaire de cuisine'.